At Sparksoft, we have put a huge focus on delivering innovative solutions with the best possible service. We have also concentrated a large effort on making our services available to you with a variety of contract vehicles and business certifications. Below, you will find our scope of certifications, vehicles, plus some of our partners and affiliations. You can find more information about our services here, and more on how we support our drive for innovation here. The HUBZone program was created by the Small Business Administration to encourage economic development in historically underutilized business zones. For more information on the HUBZone program, visit the SBA website. The Women-Owned Small businee (WOSB) Federal Contract Program was implemented in February 2011 with the goal of expanding the number of industries where WOSBs were able to compete for business with the federal government. This program enables Economically Disadvantaged WOSBs (EDWOSBs) to compete for federal contracts that are set-aside for EDWOSBs in industries where women-owned small businesses are underrepresented. It also allows set-asides for WOSBs in industries where women-owned small businesses are substantially underrepresented. You can find more information on the WOSB program at the SBA website. The SBA created the 8(a) Business Development Program in order to help small, disadvantaged businesses compete in the marketplace. This program is an instrument to help entrepreneurs gain access to the economic mainstream, and increase competitive abilities within government contracting. The program stretches over 9 years, and takes place in 2 phases. You can find more information on the 8(a) Program at the SBA website. Sparksoft joined the 8(a) program in 2015, meaning we are still in the initial years of the program. The Small, Women-owned and Minority-owned Business (SWaM) program is a state program in Virginia, administered by the Department of Minority Business Enterprises (DMBE). The purpose of this program is to strengthen the competitive abilities of SWaM businesses in state contracting. You can find more information on the SWaM program at Virginia's Department of Small Business and Supplier Diversity website. The first Minority Business Enterprise (MBE) program was established in Maryland, to help small minority businesses compete fairly on State projects. The MBE program model has been adopted to other areas across the country, and has been expanded to include Disadvantaged Business Enterprises (DBE) and Small Business Enterprises (SBE). These programs are administered locally, by State Agencies, with the overarching goal of increasing the competitive ability of smaller businesses, and improving supplier diversity. You can find more information by going to the Maryland program or the D.C. program websites. Sparksoft holds MBE, DBE, and SBE certifications in Maryland. We hold an MBE certification in Washington D.C. The SBA Small Disadvantaged Business (SDB) certification is a self-represented status, certifying that the majority owner of a firm is socially and/or economically disadvantaged. It is for small businesses, according to the SBa size standards, and intended to help these businesses compete in federal contracting. You can find more information on the SDB certification at the SBA website. 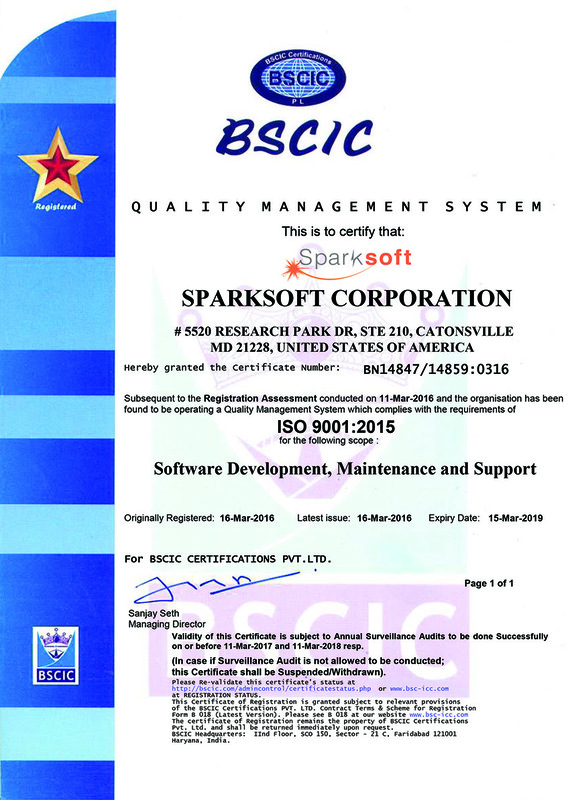 Sparksoft has been certified ISO 9001:2015 for Software Develoment, Maintenance and Support. ISO 9001:2015 is the most updated version of ISO 9001, and sets out the criteria for a quality management system, and is the only standard in the ISO family that can be certified to. This standard is based on a number of quality management principles including a strong customer focus, the motivation and implication of top management, the process approach and continual improvement. Using ISO 9001:2015 helps ensure that customers get consistent, good quality products and services. You can learn more about ISO standards on the International Organization for Standardization website. ISO certification is only provided through accredited third-party auditors, our certification can be viewed here. ISO 27001 is an internationally recognized information security management standard which ensures organizations can apply a framework to business processes to help identify, manage and reduce risks to information security. ISO 27001:2013 considers not only IT, but all business operations; this achievement demonstrates that Sparksoft has the capability to provide a wide variety of support. The Schedule 70 is the largest, most widely used acquisition vehicle in the federal government. Schedule 70 is an indefinite delivery/indefinite quantity (IDIQ) multiple award schedule, providing direct access to products, services and solutions. IT Schedule 70 offers federal, state and local governments innovative solutions to their information technology needs. - FSC/PSC Class D399 Other ADP & Telecommunications Svcs. Sparksoft received a modification from the U.S. General Services Administration (GSA) adding the new Health IT Special Item Number (SIN) 132-56 to the company’s existing IT Schedule 70 (GS-35F-161CA). The Health IT SIN was developed by GSA to assist federal customer agencies in finding IT expertise that meets their highly specialized requirements. This new SIN will pull together offerings from across the health IT spectrum including areas such as health information exchange, health analytics, innovative health IT solutions, and health informatics. T4NG is a Multi-Agency (MAC) Indefinite Delivery/Indefinite Quantity (IDIQ) Multiple Award Task Order (MATO) contract with a base ordering period of 5 years and one 5-year option period, with a program ceiling of $22.3 billion. The contract is being managed by VA’s Technology Acquisition Center. Partnered with Liberty IT Solutions, LLC, Sparksoft can provide services in the following areas through the T4 contracting vehicle: program management; strategy planning; systems/software engineering; enterprise network engineering; cyber security; among other IT- and health-related IT requirements. Interested in how to work with Sparksoft?